For a second straight day we hedged our bets between the dry line and the warm front to the north. This day was clearly different though in that as soon as we started south we broke into the clear and immediately the temperature shot up into the 80's with high 50's dew points. We headed down to Scott City, stopping there for lunch and to wait for the action to start as the mesoanalysis page showed that there was little or no CIN left and it was clear that the atmosphere was ready to pop. Soon a storm blew up to our east and we went after it, heading north and then east on Route 4, going through Healy yet again. We had to punch the storm’s core and it had some small hail in it, no bigger than quarters at most, then got on the east side with a nice wall cloud developing right next to us. I was certain this storm was going to tornado, but it wasn't ready just yet. To keep up on it we went, yes, back on the gravel roads north of Utica again! This time the roads were swamped though and we became heavily slowed by the mud. We crawled along the roads for over an hour with the storm speeding away. Finally, we reached the highway at Collyer, the same place we popped out on I-70 the previous day and blasted west as the storm approached the highway. We were only on the road for a few miles as we headed into Quinter when we came to a screeching halt as a large multi-vortex tornado crossed the interstate just a few miles in front of us! The motion was amazing. We then proceeded into town and to the north where the tornado became a large wedge. Traffic in town was crazy as we tried to get north and the storm blasted away. Two of the vans made it north of town and observed power lines and poles knocked down. Next, we moved to the east to regroup and refuel while we waited in WaKeeney for the next storm to come up. About an hour and a half later the storm was on the way and after playing on the dirt roads to the south again, we headed east on I-70 again knowing that the storm was reported to have a large tornado on the ground. About 5 miles from Quinter we looked to the south and there it was! A huge 3/4 mile wide wedge on the ground! The police shut down I-70 heading into Quinter so we were able to set up tripods right on the median of the highway and film for a good 15 minutes before the tornado finally became rain wrapped. Luckily the tornado missed the town to the west. Meanwhile, there was a monster supercell coming up from Dodge City that we decided would be our next target. This one was a right mover and looked truly ominous on radar. We headed east on the highway planning to play the east-west on the interstate game again. We bolted east of Ellis and waited... and waited... looking to the west as it got darker and darker. We decided that we were too far east and proceeded along a paved side road almost all the way to Ellis, ready to evacuate east at a moment's notice. Finally as darkness fell the tornado came rolling over the hills to our east, a large cone or small wedge, with an associated satellite or separate elephant trunk tornado just behind it. It was difficult to get a good look except during lightning or when there were power flashes. Ultimately the tornado knocked the power out in the town of Ellis and was apparently responsible for flipping some cars on I-70. After proceeding back west a bit, we went south on another gravel road to get to the top of the hills we'd been trying to get around as yet another hook came up with a reported tornado. We hung around for about 20 minutes as it came up and may have gotten a lightning illuminated glimpse of yet another tornado, but as yesterday the RFD threatened to wail on us and we had to bolt. This time around we escaped without getting cored and headed into Hays to try and get dinner, but arrived to hear the tornado sirens going off (even though there was no tornado threat) so none of the restaurants were taking customers. 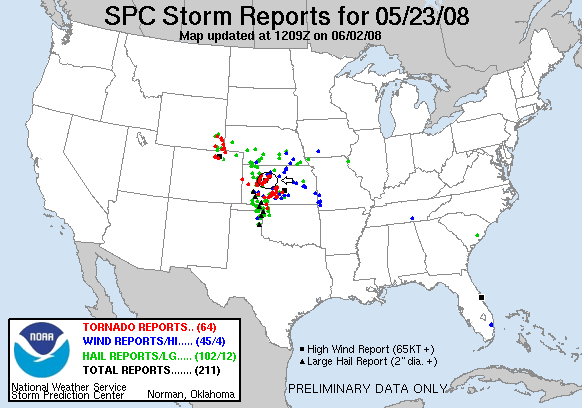 We grabbed food at a gas station and headed out for the 3 hour drive to North Platte, NE where we ended the night, having to punch a strong rain core for about the first 45 minutes of the ride. Click here to see the video of the Quinter wedge. May 23rd: The same road network as the previous day, we intercept a tornado warned storm near Scott City, KS. Here a long raggedy tail cloud develops off the storm's wall cloud. The same storm farther along it's development with a more robust wall cloud. As we reach I-70 along the same road to WaKeeney where we blew the tire the day before, a multi-vortex tornado crosses the interstate right in front of us near Quinter. This storm also dropped a large wedge tornado, luckily just north of the town. The rear wall of the wedge tornado as it speeds away off to our north. We were not able to get a real good look at it unfortunately. As we watch the wedge off north, a violent rotating lowering forms practically right on top of us! You need to see the video to "get it". We head back towards WaKeeney to set up for the next storm, which generates this huge wedge tornado just south of Quinter. We are stopped on I-70 only 1-2 miles east of where we saw the multi-vortex tornado 2-3 hours earlier. Rough day for Quinter! Enhanced version of the same photo to pull out the tornado features more. This tornado was rated EF-4 (166-200 MPH) and was close to 1 mile wide at times! More zoomed out shot of the tornado as a satellite tornado tries to develop on the east side of the wall cloud. Several more looks at this monster, a couple of which are also enhanced to bring out the detail.